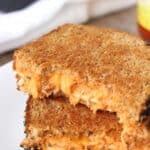 This sandwich combines two of my favorite comfort foods - melted cheese and zippy buffalo chicken. The steps are simple (as you can imagine), but the flavor combination of the finished product tastes anything but. I used a rotisserie chicken I picked up at the grocery store for the shredded chicken, which cuts this recipe time frame down to mere minutes, but I'd imagine leftover chicken would work wonderfully, too. In a bowl, stir together chicken, sour cream, wing sauce, garlic powder, and basil until all ingredients are combined. On one slice of bread, layer one slice of pepper jack cheese, the buffalo chicken mixture, the other slice of pepper jack, and top with the last slice of bread. Place sandwich in a greased pan (I like to use butter) on stove top over medium-low heat. Flip when each side reaches your desired doneness. Start with mixing in 1 tbsp of sour cream. If you prefer a more creamy buffalo chicken mixture, add an additional tbsp, or to taste.